One In A Million: Photo Of the Day and Why I Was Away. Photo Of the Day and Why I Was Away. I am sorry I have not been around to visit your blogs of late. This time of the year here is always busy, work wise and other. Sue Whyte, who passed away after at the age of 58 at the end of October from the horrific and dreaded, Motor Neurone Disease. A Brave and Inspirational lady Sue was still making final decisions for the company with her partners only a few days before she died. The ceremony held in the Princess Theatre in Melbourne was a great tribute to an out standing human being, who touched many with her integrity and kindness. I was fortunate to be picked up from the airport and accommodated by a very good friend and colleague up until my return home on Wednesday afternoon. 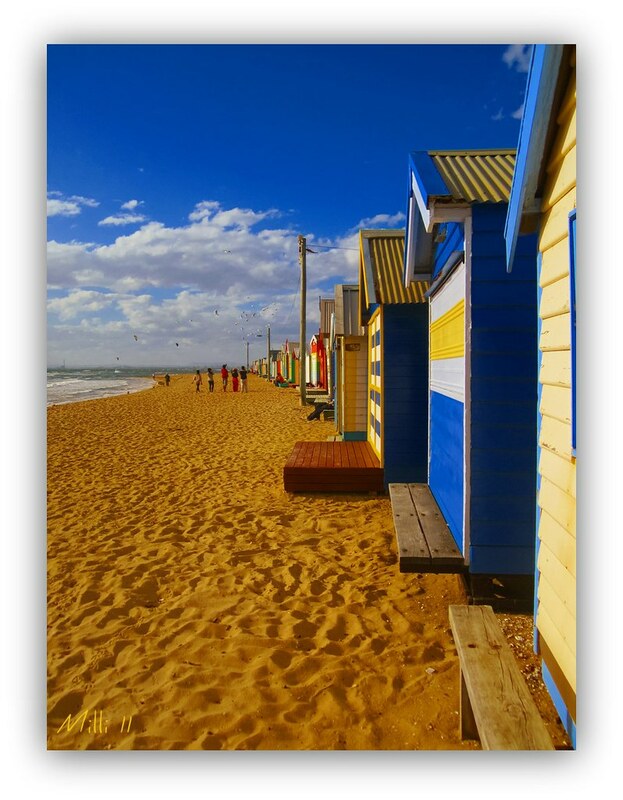 She gave me a wonderful sight seeing trip on Tuesday and the photo below is taken at Brighton Beach in Victoria where these cute little brightly painted beach shacks line a stretch of the local beach. Highly sought after these shacks although small command a high price when one does become available to purchase. However for now I am pleased to be back home in Good Old Adelaide. Milli that is like Candy to the eyes - the colour, the perspective and the framing. I like to the way the row of shacks dissappear into what the center of the photo - exceptional I reckon!! Nice to see you again - welcome back and sorry to hear about the founder of your company. Thanks ever so much Keith. I had heard about these shacks many times and even though it was blowing a gale my friend and I walked down to the beach for a look see and of course for my photo opportunities as well. I was pleased with the photos and I thank you for your appraisal of the out come. I also thank you for your condolences. Enjoy the evening Keith. Love that shot, great perspective and colour. These beach huts seem to be enjoying a resurgence in popularity in many places. You can find them here in the UK, restored and brightly painted, commanding remarkably high prices!! Sorry to hear about the passing of Sue Whyte. Thanks Mitch. I just Dug up a bit of dirt..I mean sand, lol, on the history of these iconic little boxes on Victoria's Brighton Beach and the link is here. I am so sorry to hear about the founder of your company, how sad that is....but oh what a gorgeous picture you have here! I love the way those brightly coloured shacks curl around, even as they fade away! Thanks Heather. As you know this is an insidious Disease. Sad it most certainly is. This beach was special to Sue too as she lived nearby and loved the area. So I dedicate the photo to her memory. Very beautiful photo, Milli! The golden sand, the seagulls flying, the beach huts, the walkers wearing colorful clothing and the blue colour of the sky make this a photo that I really like. the colours in that photo....the sky and the birds in the distance...the clarity of the sand....gorgeous...very good. It's a time for everything, Millie, I understand well that you were not in the mood for shopping this time. Sorry to hear about your friend, she will surely be missed. A wonderful image, so full of colours and summer! I gotta say though, this brighton beach box photo is fantastic! I love the colors, and perspective, I must get down there one day myself. These little changing rooms cost upwards of $80,000 each... basically a small boatshed, but expensive real estate right on the beach lol.. oh life could be a dream! Im coming over to Adelaide on 15 Dec, for the Flight Centre Twilight Meeting at Morphetville race track, so I am hoping to get some fashion and horse photos that Friday. I will have a day of rest on the Saturday then home on Sunday. One of these trips, we will have to meet up, and go shooting together. Fantastic photo Milli though the reason you were there was a sad one. So nice to see you again. Hugs. Missed you, wondered what you were up to. Sad about the reason for going to Melbourne, happy you had a nice time after all. Those little huts remind me of Denmark, they have these bathing huts along some of the beaches. Expensive, yes. A fantastic capture, love it and a nice tribute to your friend. Frame and hang on wall !! Welcome back, Milli. Chat later. A sad occasion but a beautiful photo.